The Mayor's Urban Agriculture Initiative grew out of the City's effort to further encourage the growing of healthy, local foods. The initiative includes the passage of the first municipal Urban Ag Ordinance in New England, the Urban Agriculture Ambassadors Program, the raising of the first City farms at South Street, and other projects which promote growing and eating of local food. 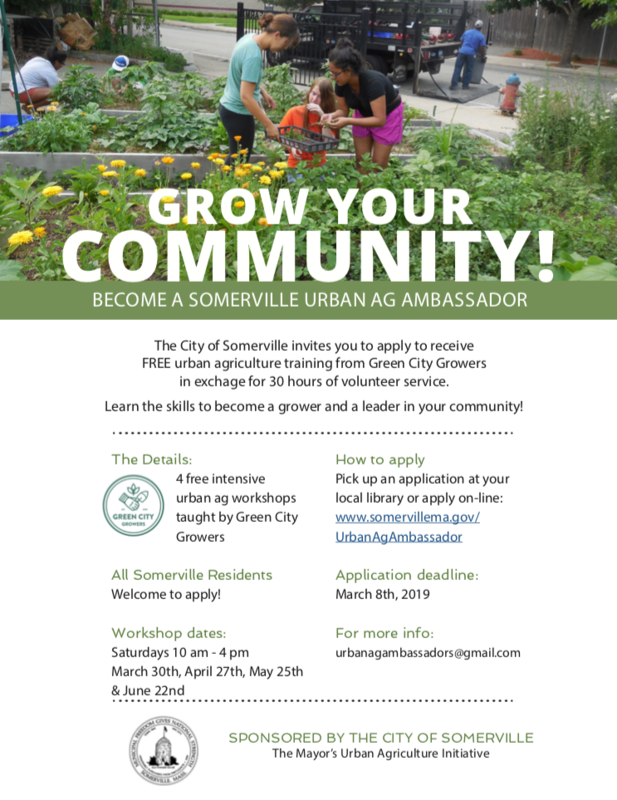 SPONSORED BY THE CITY OF SOMERVILLE and stemming from the passage of Somerville's Urban Agriculture Ordinance, the first in New England, the 2019 Urban Ag Ambassador (UAA) program trains Somerville residents in urban agriculture in exchange for 30 hours of community volunteer service. The course is FREE of charge for accepted applicants. The intention of the UAA program is to give residents the tools to successfully and safely grow food in an urban environment, leading to a healthier population. This program also helps support the work of Somerville community-based non-profits. Applications must be received by Friday, March 8th, 2019. Sessions will be held on 4 Saturdays, March 30th, April 27th, May 25th, and June 22nd, from 10 a.m. to 4 p.m. in the Green City Growers offices at 600 Windsor Place in Somerville. Topics include, but are not limited to the following: building a raised bed, planting, harvesting, pest control, season extension, leadership development, Somerville urban ag ordinances, and an introduction to bee and chicken keeping. All applicants must be residents of Somerville and must commit to volunteering 30 hours by the end of 2019. The bulk of the volunteer hours will happen during the main growing season, May-September. Several opportunities with local organizations will be available but participants are also able to propose their own projects. All accepted applicants must be available to ATTEND ALL FOUR Saturday sessions, listed above, from 10 a.m. to 4 p.m Additional hands-on "work days" will also be required during the growing season but are very flexible. Participants will be asked to communicate regularly with a coordinator to check-in about the volunteer part of the program, and to submit one written or photo journal entry about the project. Open to ages (16 and up) and all skill levels. The workshops are designed for beginning to intermediate gardeners. We may ask very experienced applicants to act as mentors/resources for ambassadors. Speakers of other languages and bilingual residents are encouraged to apply. 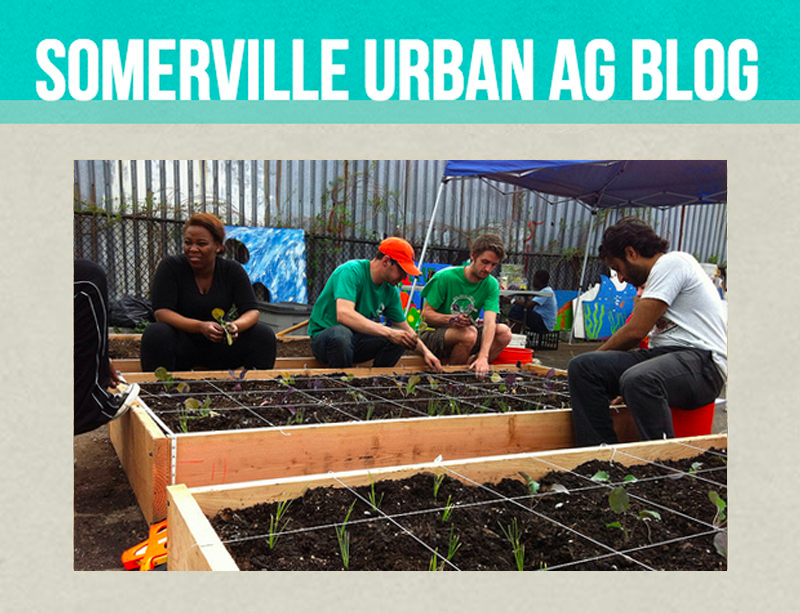 The document found here, "Somerville ABC's of Urban Agriculture," simplifies the Somerville ordinance and the Board Of Health rules, connects people to existing community resources and highlights some of the best emerging practices in the fields of urban agriculture, beekeeping, and chicken keeping. 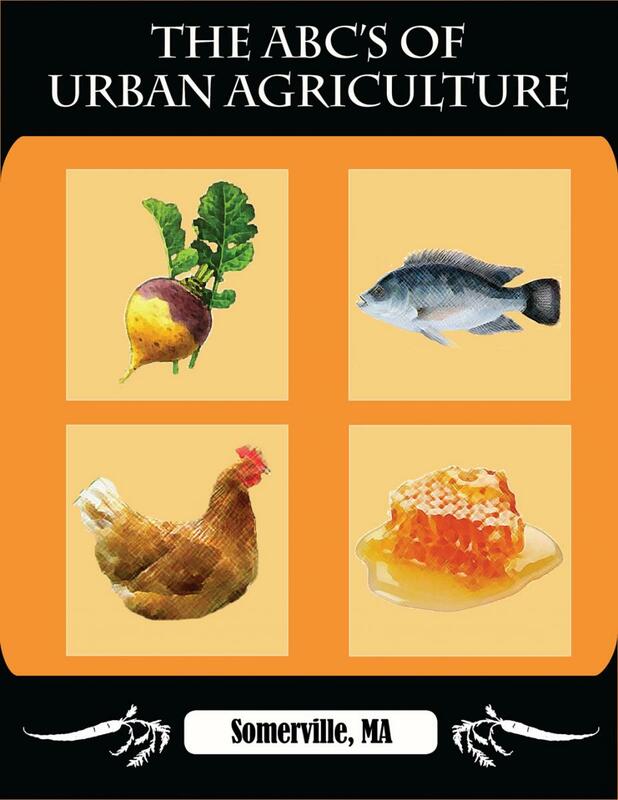 The ABC guide also contains the necessary forms for obtaining a license for the keeping of bees and chickens.